Living in West Texas means more then just getting sick as a reason for not being able to breath. It also means the constant flow of allergies year round. My middle son has a lot of breathing troubles and even takes several daily medications. Some days struggling to take in enough oxygen. We often look for another ways to open up his breathing passages. Vapor rubs have been one of the ways we help him clear his breathing passages. Maty's All Natural Vapor Rub is wonderful! In fact I'm not sure I can say enough about it. My favorite part is that I can pronounce and recognize EVERY ingredient in it and it is petroleum free. Since we started using this product my son has woke up with so much more energy. You know they say right on the box that their "petroleum free blend of essential oils boosts immune function while it helps to open air passages." Honestly I see it more and more every day! Maty's is not greasy like some other brands and goes on easy. We will be a life time user and it is also available in a baby chest rub.To check out their other products you can visit their website http://www.matyshp.com/. Looks like a great product,I try to use all natural as much as I can. Vapor rub is awesome! Never tried this brand, but looks great. OH I'm so glad I found this! I've always wondered if there was an all natural one. The other ones burn my kids and we have gone all natural anyways - I'll have to look for this! I like that it's not greasy! 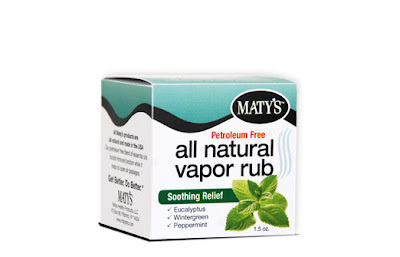 I love vapor rubs, but they tend to be too oily. I grew up with Vick's because I was always so sickly as a child, and i hated the greasiness of it. I really want to try this. I like how it is not petroleum based. Thanks for sharing this.